On 16th July, 1940, Winston Churchill told the newly appointed head of the Special Operations Executive, to "set Europe ablaze". With this simple instruction Churchill set in motion some of the most dangerous and brilliant actions of the Second World War. The men and women of SOE performed acts of sabotage, subversion and espionage so extraordinary that if they were portrayed as fiction, they would beggar belief. These agents pushed bravery and human endurance past limits that most of us can only imagine. 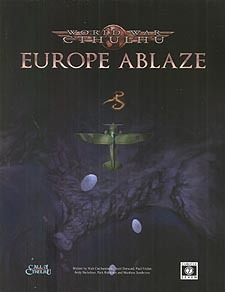 Europe Ablaze presents six missions demanding such resourcefulness and determination, all set in the European theatre of operations. Some are inspired by SOE missions or historical events, while others take a more imaginative view of the conflict, but all are rooted in the all-too-real horrors that the Second World War brought about. All of them add that special twist that being part of N’s network demands, and the dangers of the Mythos will prove at least as dangerous as a bullet from the Gestapo.